Unreadable Memory Card? Picture Rescue to the Rescue! If you have ever shot photos with your digital camera and had your happy smile turn to panic when your card is unreadable, then Picture Rescue from Prosoft Engineering might just save the day and salvage that smile! There are a few things that every digital photographer should have -- extra batteries, a battery charger, extra memory cards, and just possibly, a copy of Picture Rescue! When you spend as much time as we do in the technology arena, you get used to the ebb and flow of new products all of which make incredible promises, and after a bit of time with these products you start to look past the press releases and shouts of new and improved from the vendors and PR folks. But every once in a while you come across a product that does exactly what it is supposed to do, and which quickly becomes an indispensable tool in your arsenal of defenses against the dark lords of Murphy's Law as it relates to computing. But what he had done instead was erase the important files, and then downloaded and backed up the discards! And after he did that, he then proceeded to format the card, and then, and only then did he realize what he did. So, at 10 o'clock at night, just as I'm trying to leave my office, he shows up, card in hand, utterly devastated. Did I know, he pleaded, of any tools that might help him recover the images? Lucky for him, I did! I loaded up the card into the card reader, launched Picture Rescue from Prosoft Engineering, Inc. and let it go to work. To be honest, I didn't have that much hope for the data. After all, not only had he erased the individual files, he also formatted the card, and then while searching for the files, he shot a few frames, mostly in the RAW+JPEG mode, which possibly overwrote some files, and the card was almost full to start with. So, I let him down gently,.. maybe we could salvage a few files, but no guarantees, since this was pretty much a worse case scenario. As the computer chugged along, sifting through the data on the card like arms inspectors searching for weapons of mass destruction, amazingly, unlike those unsuccessful inspectors -- image after image slowly appeared. Not every image mind you -- all but 4 or 5 of the hundreds of JPEGs were usable. And, while some of the RAW files were recovered, most of them weren't useful due to parsing errors. But hey, sometimes I think it's a miracle that RAW files open at all, given the lack of cooperation of the camera companies and proprietary nature of the files involved! At the end of the night, he had all the images he needed for the client, and carefully wrote down the name of the program and the website (www.prosofteng.com) for the software, swearing at himself that not only was he going to be much more careful in the future, but that he wouldn't go anywhere without it. And you know, I agree with him. It's a great product, at a reasonable price ($59 MSRP), that does exactly what it promises to do. For those confronted with a seemingly corrupted or unreadable flash media card Picture Rescue is a real lifesaver. Since I first reviewed Picture Rescue last year, it has gone through several changes, the most notable is the port to Universal Binary, which on my system revealed a far faster recovery time. I did find that using a fast media card reader, such as a Firewire or USB 2.0 model, seemed to result in faster recovery as well. Another important note, is that while it’s not a secret, but also not an advertised limitation, flash memory cards used for capturing digital images have a finite life span. I met recently with one of the leading manufacturers of digital media cards, and he advised me to start dating my cards, and with average use to count on a life span of around 3 years before read/write errors started to occur. This might come as a shock to some, but these cards have a limited number of Read/Write cycles, and then they start to degrade. So, even the most obsessive compulsive Felix Unger photographers among us, might just find themselves rushing to the medicine cabinet for a bit of Picture Rescue one day. At least we have an remedy in the arsenal should that day come in Picture Rescue. And the best thing IMHO about the recent upgrades to the application is that they really aren’t visible. There isn’t a fancy new interface, just quietly engineered new features under the hood, and that friends, is my definition of how software should evolve. I’m less entranced by new features than I am by software that doesn’t crash, is reliable, and affordable. 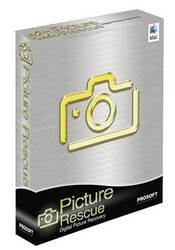 Picture Rescue 1.2 is just that.